Learn how to make either or even both kusudamas. They are a great origami decoration all year round! Both kusudamas uses 6 sheets of square paper, but the Origami Clover kusudama can be made with 30 sheets of square paper as well. 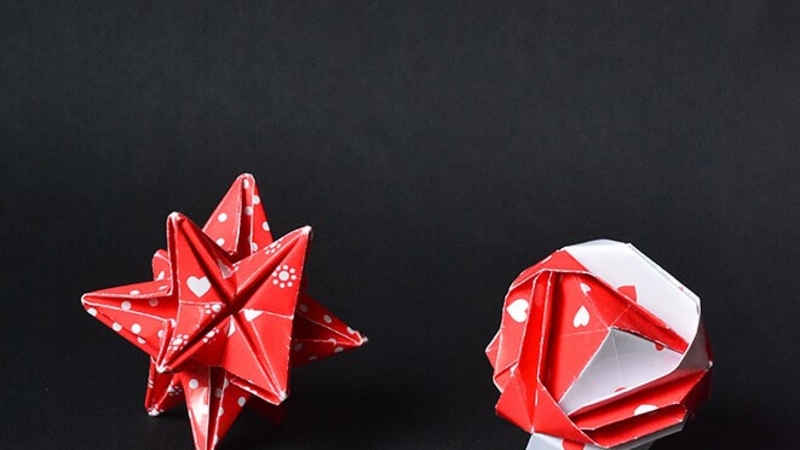 These modular origami star decorations are quite easy to make, you can use only one color or pattern or go crazy and used 3 or even 6 different colors patterns for each kusudama. Even the assembling is easy, as you don’t need glue to attach the modules together. I love the green, blue and yellow star. It is such a beautiful art form and you can do it with so many different colors of paper. Cool origami art! The design looks complicated to me but following the tutorial videos, it’s just easy to assemble, awesome! You have just give me an idea for my next Christmas decoration with my children. They love the origami ! next post or I will search your blog, to see different type of origami that we can do. How about frog origami? These things look amazing, thank you for sharing them with us. I always wanted to learn how to make origamis. This is so pretty !! you’re talented !! I love origami !! I have always been fascinated with origami! It is such a magical and amazing art-form. Cool stuff! I’ve always been astonished by origamis and the like since I was a kid and this is amazing. I haven’t tried origami since I was a kid! I bet I would do so much better now that I am adult and don’t get as frustrated as easily! I will give these a try! This origami is so pretty! I especially love the pastel star. Such a helpful tutorial too. I foresee a fun craft project with my kids! This is so cool. I would love to make one of these origami stars. Thanks for sharing. I just love these. Beautiful creative art! I’m definitely giving this a try! Thanks for sharing! Cool origami art displays. I may consider to may some myself. I like the colors and patterns. Looks so much easier with the tutorial you shared. Origami is so darn cool! I wish my hands and eyes worked well enough to make such beautiful creations. And I have never seen origami done with patterned paper. So cool! These are so cool! My kids love origami and are always on youtube trying to learn new things. Such an adorable art form. Philip Shen’s designs are fantastic. Origami is fun and engaging. It may look simple but it takes a lot of your concentration and patience. Great origami there. These look so amazing and cute! I can only imagine how difficult these are to make and how much time it takes to learn. I always thought origami was done with a single sheet of paper, so to see these can be done with as many as 30 is absolutely mind blowing!